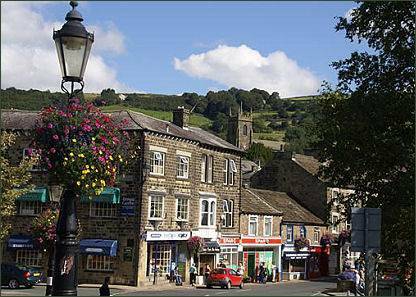 The small market town of Pateley Bridge, known locally as Pateley, is situated in Nidderdale, an Area of Outstanding Natural Beauty and lies on the River Nidd, which flows from the fells around Great Whernside. The town is the start and finish point of Nidderdale Way Long Distance Trail, which runs for 53 miles through the spectacular scenery of the Nidd Valley, the Six Dales Trail, which runs for 38 miles from the Jubilee Tower in Otley to the Market Cross in Middleham also passes through the Pateley Bridge. In the early middle ages the site of Pateley lay in lands of the Archbishop of York, which came to be known as Bishopside. In the twelfth century the principal settlement in Bishopside was at Wilsill, rather than Pateley.The first written record of Pateley occurs in 1175 where it is referred to as Patleiagate, deriving from Old Norse word 'gata', meaning street and the northern dialect form 'brig' for bridge. Pateley may derive from the Old English word 'pæþ' - path, in the genitive plural form paða and leah which means open ground, or clearing in a forest'. The town was granted its market charter by the Archbishop of York in 1320. 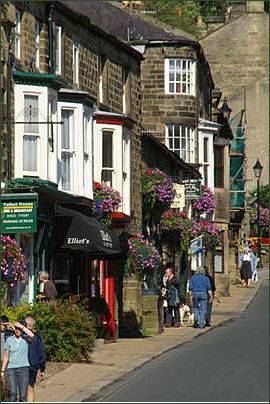 There are numerous local shops, tea rooms, bed and breakfast establishments, hotels and pubs in Pateley Bridge. 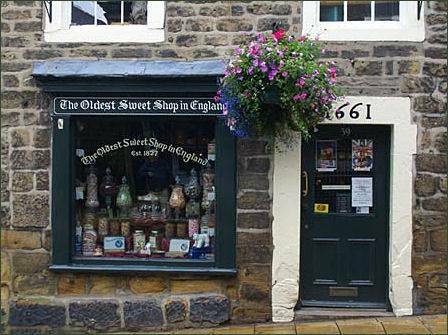 The town is famous for housing the Oldest Sweet Shop in England (pictured below left) which was established in 1827 and is the oldest existing building housing a sweet shop in England. Trading continuously since 1827, the shop is an official World Guinness record holder and has appeared on national televisionIt is one of the few authentic traditional old sweet shops still selling retro sweets of a bygone age. The King Street workshops are situated on King Street & house a talented group of artists and designers. Their studios are open to the public and include jewellers, milliner, textile art and gifts, sculptors, fine artist and glassblowers. The village is also home to a popular annual agricultural show, which is held annually on the showground by the River Nidd. Coldstones Cut is a man made land sculpture cut in to the side of Coldstone limestone quarry, the views from there are stunning and on a clear day, it is possible to see all the way to the Yorkshire coast. Nearby Brimham Rocks are amazing balancing rock formations on Brimham Moor. Yorkshire's 'Little Switzerland', or How Stean Gorge as it's more commonly known, carved out over thousands of years by waterflow, The gorge is nearly a kilometre long (1/2 mile), and is as much as 80 feet deep in some areas, it is crossed by several narrow bridges. At the Via Ferrata, visitors can experience the thrills of balancing on beams and ladders and traversing the rock face above the rushing water. The fantastic geological formations of Stump Cross Caverns, one of Britain's premier show caves, descend to 20 metres below the surface and contain amazing limestone formations. The caves at Stumps Cross were discovered in 1860 by miners who looking for lead seams in the Yorkshire Dales. 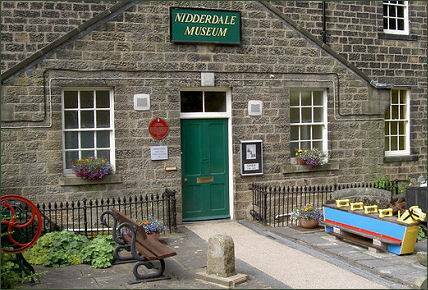 The interesting Nidderdale Museum is situated in King Street and is housed in Pateley Bridge's original Victorian workhouse. There are sections devoted to agriculture, industries, religion, transport and costume, set out across 11 rooms. It contains recreations of a cobbler's shop, a Victorian parlour, a general store, school room, eighteenth and nineteenth century costumes and the History of Transport in the Yorkshire Dales along with many other artefacts of interest. The museum illustrates all aspects of life in the Yorkshire Dales in the past and reflects the life of ordinary people in imaginative and realistic settings.